Madeleine's 24-Hour Product Diary: Am I Doing This Right? A couple of weeks ago, while stuck in a stalled subway car, I tried to entertain myself by tallying up the total amount of money I’ve spent having my hair dyed. “Considering that I’ve been coloring my hair once every 2-4 months since I was 17...” Here I stopped. The cost is too depressing and what I learned in that brief amount of time is that I don’t want to know. I never want to know. But, for better or worse, I am determined to write this product diary and catalog every useless, over-priced zit cream and shampoo that I currently incorporate into my day. Maybe you’ll learn something from my folly. Ideally, that lesson will be “Dang, Madeleine looks great and it every cent she spent was worth it,” but I’ll leave the reactions up to you. Sometimes I will take a shower first thing in the morning, but usually I will instead use this time to lie in a crumpled pile and complain loudly about how tired I am, how my joints hurt, etc. My shower routine is fairly simple, but somehow—like everything in my life—it takes forever. For my body, I use two things. First, PanOxyl body wash because I am a full-grown adult who still occasionally gets bacne (lucky me). I’ve also recently switched from bar soap to Dr. Bronner’s because I have very sensitive skin and thought that something more natural would be beneficial to me. (So far, so good.) Here’s the weird thing, though: the Dr. Bronner’s peppermint soap kind of burns? But in a good way? Like, whenever I lather up, I jokingly refer to it as “adding a little bit of spice” because I’m both insane and a pervert? MOVING ON: For conditioner, I use whatever cheap color-treated stuff I can find. Lately, I’ve been working through a bottle of Garnier Fructis and it’s okay. Because I have naturally curly hair, I only comb my hair when it’s wet. (A lot of curly haired people don’t comb their hair at all, but this is about ME, not THEM.) While it’s damp, I take about a nickle’s worth of Bed Head Manipulator and a small pump of defuser and, after mixing the products together in my palms, spread them evenly throughout my hair. 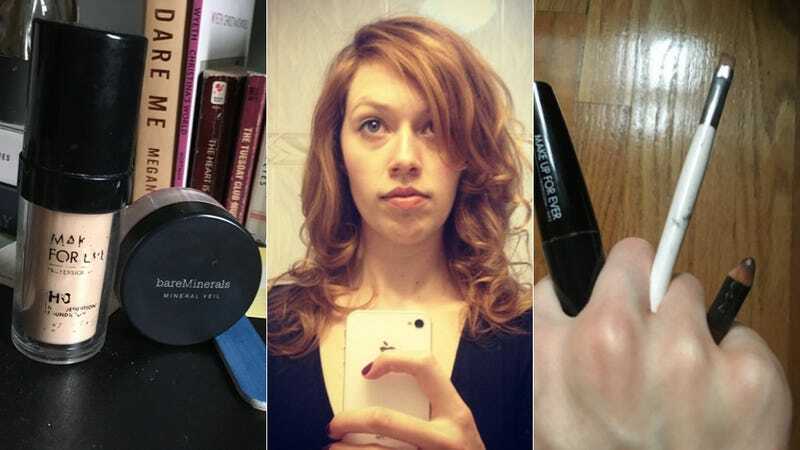 I learned this trick from former Jezebel editor Tracie Egan Morrissey and I am forever grateful to her for it—it gives my curls much needed structure, volume, and hold. Without it, I end up looking like a frizzy lil puff ball. To finish, I blow dry it with a defuser. Want to know what the most important product in my arsenal is? Eye drops with redness relief! I don’t know why, but I wake up every morning looking like a 28 Days Later zombie and this is the only thing that helps. I truly love applying makeup, although I rarely get adventurous with it. That said, I’ll sometimes do this thing where I pretend that I’m an actress and my bathroom is the makeup trailer (yes, I am almost 30 years old), which makes putting on makeup (I guess I’m both the actress and the makeup artist?) even MORE fun. You should try it. For my usually daily look, I apply an even base of Make Up Forever HD foundation. It works great and goes on smooth. I then top that off with a light layer of mineral powder to cut down on shine. I’m currently using bareMinerals and I don’t exactly love it (the shade I got is a little too pink), but the container is convenient and—unlike a compact—it will not shatter into a million pieces if you drop it on the ground. I then use MAC Eye Kohl in “Teddy” as both eye liner and eyebrow pencil. It can be a little smudgy so I beat it to the punch by smudging it myself with an angled eye brush. Both my eyebrows and eyelashes are very light, so I finish my eyes with Make Up Forever Smoky Extravagant mascara, which I got as a part of their limited edition Fifty Shades of Grey makeup kit. I bought the kit to mock it on the internet, but really, the joke was on me because all the Fifty Shades products are great and I use them all the time. I finish it all with Sugar Lip Treatment in “Ruby.” Or I did up until recently when it melted all over my purse. Note: I wasn’t lying about having curly hair. I am however lying about being a redhead and recently got a blowout after going to the hair salon. This is on Day 3 without washing it. I *think* I can stretch it to Day 5. So work is done, I’ve sweated all my makeup off, and now it’s time to PAAAAAAARTY. My evening beauty regimen is almost the exact same as my daytime regimen, but with a few extra flairs. Like, rather than use brown pencil eye liner, I’ll use black liquid eyeliner (the kind that came in my Fifty Shades of Grey makeup kit actually). Or, if I really want to go crazy, I’ll use TEAL liquid eyeliner because it makes me feel like David Bowie and/or a very cool Tumblr teen. Unfortunately, this also means that I have to wear Urban Decay Eye Shadow Primer Potion, which a lot of people love, but I think it totally hugs nuts. I only wear it because my eyelids get a little oily, which causes my eyeliner to slide all over the place. The primer—despite being thick and gross—still only works half of the time. I’ve asked for other recommendations, but the people at Sephora assure me that Urban Decay is the best so I guess I’m stuck with it until something better comes along. I then top my lids with Nars blush in “Miss Liberty” because it’s very light and shimmery...and also because my cousin used to work for the company and I got it for free. Many moons ago, I was on the hunt for a lip color similar to the one worn by Debbie Harry in her Andy Warhol polaroids. My insightful friend Molly suggested that I check out Clinique Butter Shine Lipstick in “Ambrosia” and the rest is herstory. I wear it all the time—both at day and at night—and love the heck out of it. The color—described by Clinique as a “rich punchy golden red orange”—is unique and flattering. I have other lipsticks, but I always come back to this one. Last thing I do before leaving the house is dab on the lightest amount of Attar Bazaar scented oil in Tunisian Amber. I can’t full describe the scent, but I can tell you that it’s the only perfume I’ve ever been able to stand. It’s also the same perfume that my mom has been wearing since I was a baby, so that probably has something to do with my attachment to it. You know what I’ve always been good at? Washing my face before I go to bed. For the past couple years, I’ve been using Avalon Organics’ Vitamin C Renewal Refreshing Cleansing Gel, which you can find in the beauty aisle of pretty much any health foods store. What I like about it is that it smells really nice (just a gentle touch of citrus) and is so freaking gentle. I finish off with a bit of CeraVe night cream and—if needed—a dab or two of some over priced blemish treatment that does not work. I continue to use it, though, because I love a good exercise in futility. Finally, I slather my lips with Aquaphor or vaseline right before I go to sleep because, as the weather gets dryer, my lips tend to crack and sometimes they’ll even bleed all over my pillow. Weirdly, I don’t like that! Those are the beauty products I use regularly, though I own plenty more. Altogether, they cost...never mind. Why would I do that to myself?